This security poster illustrates the MON-100 & MON-200 Directional Russia Anti-Personnel Mines. The two mines operate by the same method, and the MON-200 is a larger version of the MON-100. Both mines use circular dished shaped bodies and are fitted with a bracket and spike to allow mouthing to a tree for operation. Both mines are electrically operated. 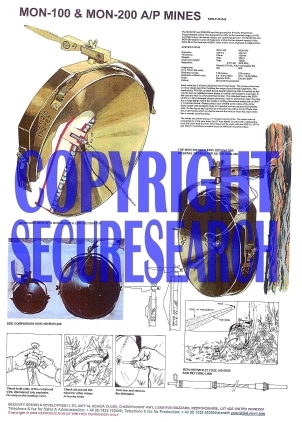 This security poster features the technical specifications of both the MON-100 and the MON-200 Anti-Personnel Mines, illustrations and explanations on how to disarm the mine, a sectioned view of the MON-200 with EDPr detonator, the MON-100 with EDPr detonator, the MON-100 with ZT fuze lighter and detcord link, and size comparisons of the MON-100 and the MON-200. A sectioned view of the MON-200 with EDPr detonator. The MON-100 with EDPr detonator. Size comparisons of the MON-100 and the MON-200. The MON-100 with ZT fuze lighter and detcord link. Illustrations and explanations on how to disarm the mine. The technical specifications of both the MON-100 and the MON-200 Anti-Personnel Mines. This security poster features the technical specifications of both mines, illustrations and explanations on how to disarm the mine, a sectioned view of the MON-200 with EDPr detonator, the MON-100 with EDPr detonator, and size comparisons of the MON-100 and the MON-200.